Today I am featuring Priya, a fellow Londoner I met through Twitter (@DietitianUK), but have yet to meet face-to-face. 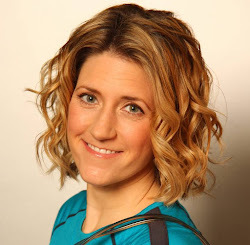 She has great nutrition and fitness tips as she is a dietitian and pilates instructor. She offers up fantastic gluten-free recipes and other yummy stuff that is easy to make. She posted this Tomator, Pesto, and Mozzerella Tart on her blog earlier this month as a healthy alternative to serve at a pot luck or BBQ (serves 8-10). I think you can serve this warm or cold. Most of the ingredients you probably have on hand. Enjoy! 1. Spread the puff pastry sheet on a greased non stick baking tray and preheat the oven to Gas Mark 7 (not sure of F temp. Try 350?) When putting on the toppings you want to keep about a 1 inch edge border free from topping. 2. Spread a thin layer of tomato puree on it and then follow with a thin layer of pesto. 3. 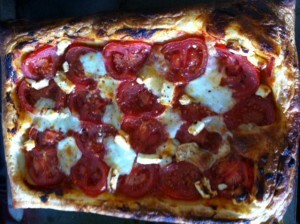 Cover with thinly sliced tomatoes and dot with pieces of mozzerella. 4. Bake for 15-20 minutes. 5. Slice into bite sized pieces. Nutritional Info: Per portion for 10 people 130kcals, 8g fat, 10g carbohydrate, 4g protein.